Choose a plan and get up and running! From app to inbox every time, using the best tools, support and technology. We currently have quite a few plugins and we’re working on others. Feel free to contribute your own! Create and design email templates that are separate from your app, so changes can be made quickly and easily. Easily personalize templates using variables to customize emails tailored to fit each individual user. Single messages or mass mailings. Confidently send personalized emails to 1, 10, or 10,000 users on one API call. Our Smart Queue organizes the priority of all messages in the system for more efficient sending. Our plans scale with you so you only pay for what you need. Detailed reporting provides valuable insights into your emails and your users. Open tracking for each individual email to understand which emails are being read by your users. 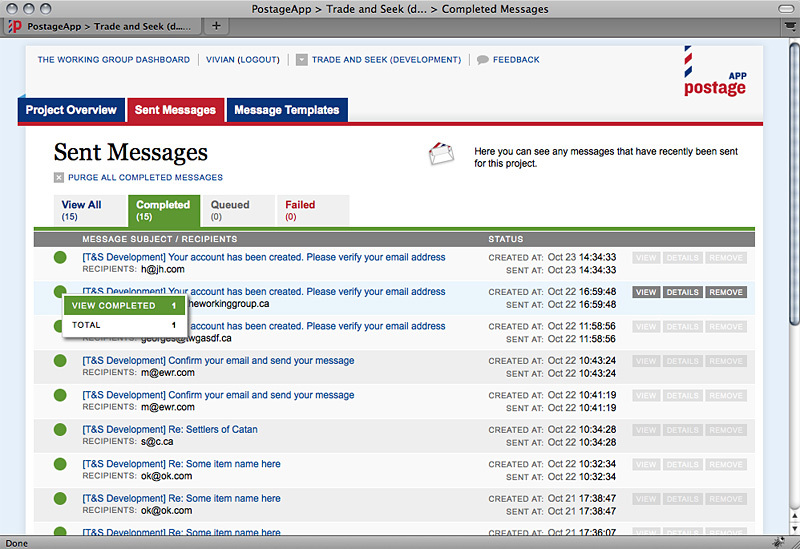 PostageApp ensures that your emails land in the inbox. Whitelisting, FBLs, proactive monitoring for best practices. We focus on the delivery of your email so you can focus on building awesome apps!